There could be much more water trapped with minerals deep in the earth’s interior than all the surface water in the oceans. 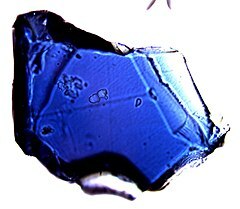 BBC: Diamonds, brought to the Earth’s surface in violent eruptions of deep volcanic rocks called kimberlites, provide a tantalising window into the deep Earth.A research team led by Professor Graham Pearson of the University of Alberta, Canada, studied a diamond from a 100 million-year-old kimberlite found in Juina, Brazil, as part of a wider project. They noticed that it contained a mineral, ringwoodite, that is only thought to form between 410km and 660km beneath the Earth’s surface, showing just how deep some diamonds originate. While ringwoodite has previously been found in meteorites, this is the first time a terrestrial ringwoodite has been seen. But more extraordinarily, the researchers found that the mineral contains about 1% water. While this sounds like very little, because ringwoodite makes up almost all of this immense portion of the deep Earth, it adds up to a huge amount of deep water. …. discovered the first-ever sample of a mineral called ringwoodite. 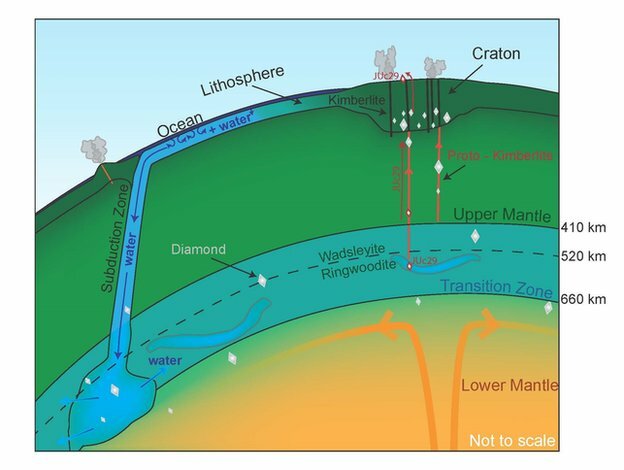 Analysis of the mineral shows it contains a significant amount of water—1.5 per cent of its weight—a finding that confirms scientific theories about vast volumes of water trapped 410 to 660 kilometres beneath the Earth, between the upper and lower mantle. …. Ringwoodite is a form of the mineral peridot, believed to exist in large quantities under high pressures in the transition zone. Ringwoodite has been found in meteorites but, until now, no terrestrial sample has ever been unearthed because scientists haven’t been able to conduct fieldwork at extreme depths. ……. Scientists have been deeply divided about the composition of the transition zone and whether it is full of water or desert-dry. Knowing water exists beneath the crust has implications for the study of volcanism and plate tectonics, affecting how rock melts, cools and shifts below the crust.